Probably the best web-based trading platform ever made. ProRealTime version 11 delivers many new features to make trading easier and more enjoyable. The objects toolbar can be displayed or hidden from the main window. Scrollbars in lists only appear when the mouse hovers over the window to save screen space. You can now choose between a fixed density for your lists (small, medium, large) or an automatically defined density based on list size. The new dropdown menus are displayed in columns to make it easier to find what you are looking for and include a search bar. You can now move all windows on a single screen at once by using ctrl + clicking on the title bar. This is useful to transfer multiple windows from one screen to another. You can then use the multi-window feature in the options menu to fit all windows to the new screen size. The options menu has been re-designed and now includes a search bar to allow you to find more easily the settings you are looking for. A quick configure button is now available in several windows of the platform. This enables configuration mode which lets you select a zone of the window to immediately open the configuration options of the related zone. The charting window buttons and menus have been optimized to take less space and give more space to the chart itself. Buttons allow you to quickly display/hide trading features, charting tools, and trading journal. The trading information panel and the trading panel can be placed side by side to save additional space, or placed on 2 different lines to display more order types. When placed on 2 different lines, the trading toolbar car now be displayed across the entire chart window to make room for additional trading tools. You can display/hide instrument information in the background of the chart. Displayable information includes: ticker, name, timeframe, market. The position of the watermark can be customized. Charting windows title bar can be customized to display only the information you need. Time frame and historical data selection are now available from the title bar to save space in the charting window. Many buttons and features such as the "Add indicator" button have been regrouped at the bottom left of the chart. Clicking the arrow icon can turn the toolbar into a menu to save additional space. This will happen automatically if the window is to small to display all buttons. Timeframe and historical data dropdown menus can now be entirely customised. You can add your own timeframes and historical quantities to the menus and hide the ones that you do not use. 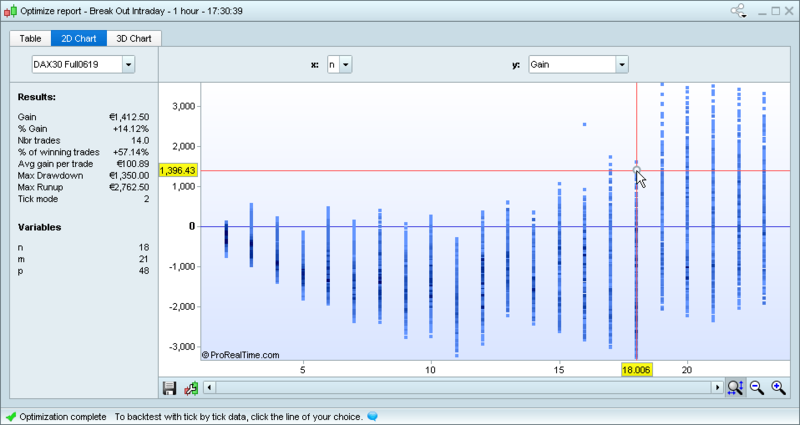 Non time-based chart styles such as Renko, Kagi or point & figure now allow you to display most indicators (on price and below the price). A new chart style “hollow candle” has been added. Candle borders can be colored differently from the main candle for increasing and decreasing candles. Candle border color is determined by an increase/decrease of the close compared to the open. The candlestick is hollow if the movement was bullish during the candle (close > open) and filled in if it was bearish (close < open). The price panel now shows chart styles graphically to facilitate switching between them. You can now choose to display (or hide) the name of all indicators displayed on your charts. Clicking the name of an indicator allows quick access to indicator settings, hiding the indicator or removing the indicator. Indicator settings have been re-designed to be easier to use. Indicators with multiple different lines can now be configured within a single panel (colors, line size and thickness, lines displayed or hidden…). You can now save several configurations for your indicators and price, and easily switch from one to another. Color zones can all be configured within a single panel also. A new option lets you define the level of opacity of the color zone in %. A low opacity will give you a more transparent color zone. You can now create different chart studies which are independent from eachother on the same instrument and timeframe (example: different studies for support/resistance and for Fibonacci/Gann). Objects in different chart studies are independent from eachother - only the objects you have drawn on a specific study will appear in that study. Each chart study is specific to a financial instrument and is available no matter what workstation template you are using (ex: multiple screen template or single screen template). Use the dropdown menu attached to the "Objects" icon to switch quickly between your chart studies or create a new one. Each study can be displayed on all charts of the instrument or only on a selected chart. This allows you to display simultaneously several charts of the same instrument with different chart studies. You can also duplicate a study or move objects from one study to another. 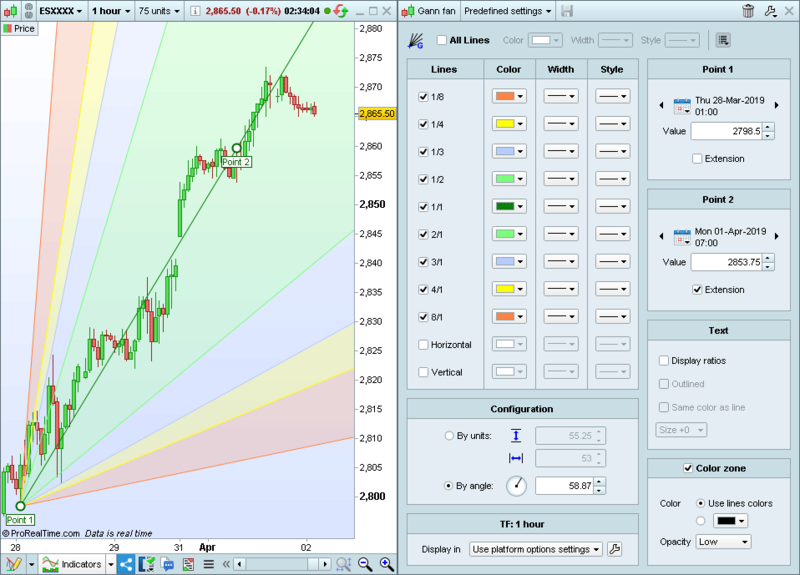 The object toolbar can now be displayed or hidden on all charting windows, and in the main ProRealTime window. This will allow you to access drawing tools and objects more quickly. To display or hide the drawing toolbar from your charting windows, click on the drawing icon at the bottom left. The toolbar can be customized to display the tools that you use in the order that you want. 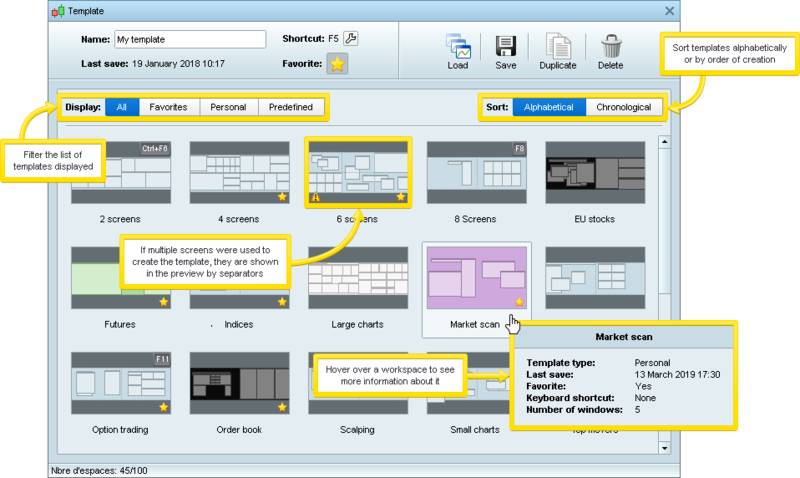 If your charting window is smaller than the toolbar, use your mouse wheel to navigate through the toolbar. Create and save several types of configurations per object (ex: red line and green line) to save some time when using drawing tools. From the object's properties window, save your current settings under a new name. It becomes an object template. Once an object has been created, you can access it from the object's properties. For quicker access, you can add an object template to the objects toolbar or even set up a keyboard shortcut. In cursor mode, objects can now be modified (without using a dedicated modification mode), making it easier and more comfortable to use them. New drawing objects have been added : Head & shoulders, Impulsive Elliott waves and corrective Elliott waves. You can choose time frame transfer settings separately for lines, horizontal lines only, and other objects. In addition to global configuration, you can also individually configure object transfer settings for an individual object or for an object template. Object configuration windows have been redone with additional customization possibilities for several objects (levels, colors, associated texts...). 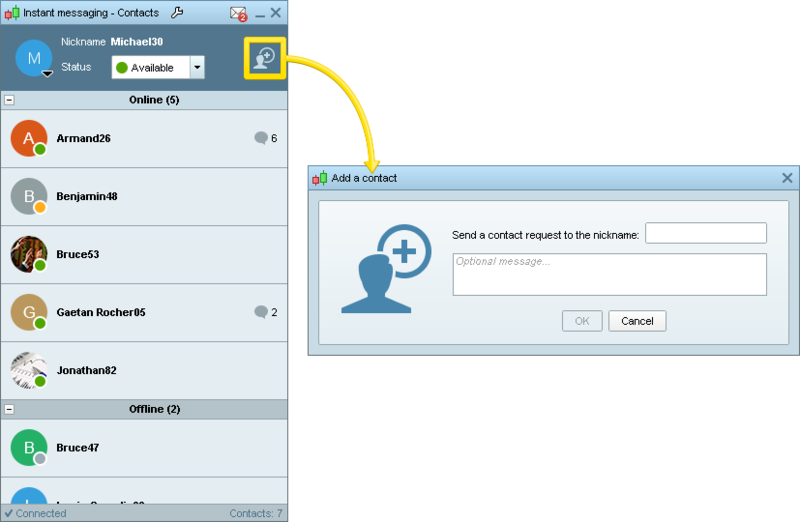 A new instant messaging feature has been added to the platform. Once you have chosen a nickname, you can add your friends to your list of contacts by clicking on the "+" sign. 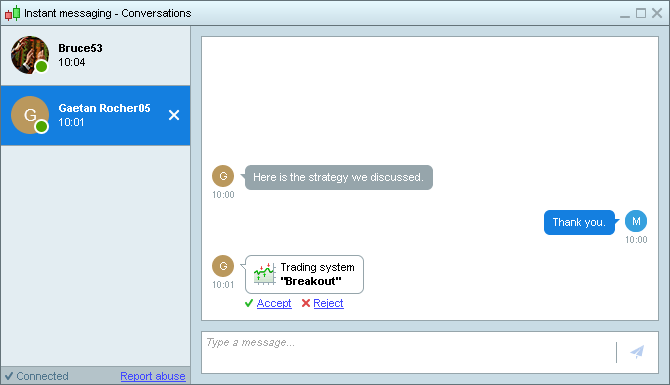 The instant messaging feature allows you to share charts, indicators, trading systems and market scans with your contacts. It is possible as for sharing via a file, to chose if the recipient will be able to edit the code or not. If you receive a chart study from a contact, it will be saved in your platform as a new chart study and you can modify it at will! New optional buttons in the trading toolbar allow you to quickly place Limit orders at the best Bid or best Ask price. The order ticket (manual entry of orders) has been redesigned. It now lets you enter orders much more quickly with less clicks required. You can also chose to display a preview of the order on your charts. Display of recently executed orders on charts has been improved. Hover over an order to see the details including position size before & after the execution. You can click on a recently executed order to display it in the "Order List" window. 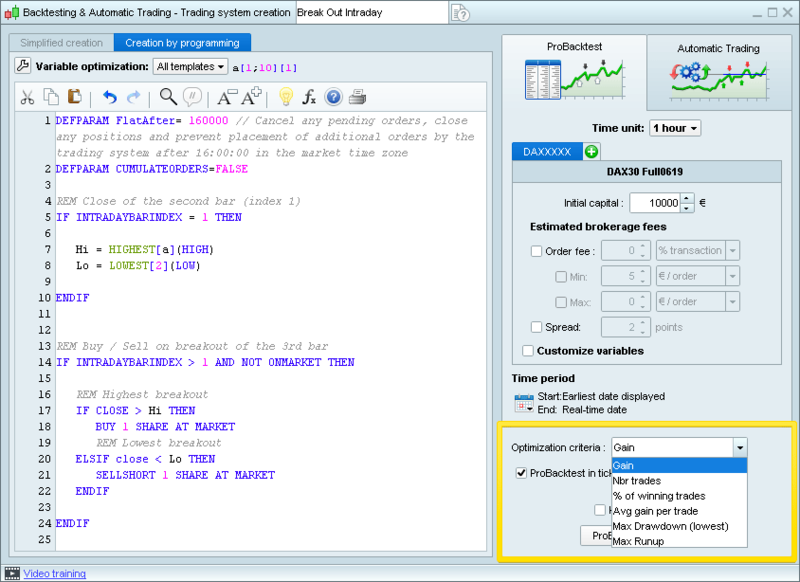 After running a Backtest, you can also click on any order on the chart to display the corresponding trade in the ProBacktest results window. For each group, a summary line will show you information related to the group such as Latent Gain and Exposure. Several additional optional columns have been added to the portfolio window including %Exposure, Delta (for options) and TTL (time to live). You can also create custom groups of positions and name them as you wish, such as for example "Long term positions" / "Swing" / "Short term positions". The comments area below charts has been transformed into a trading journal. 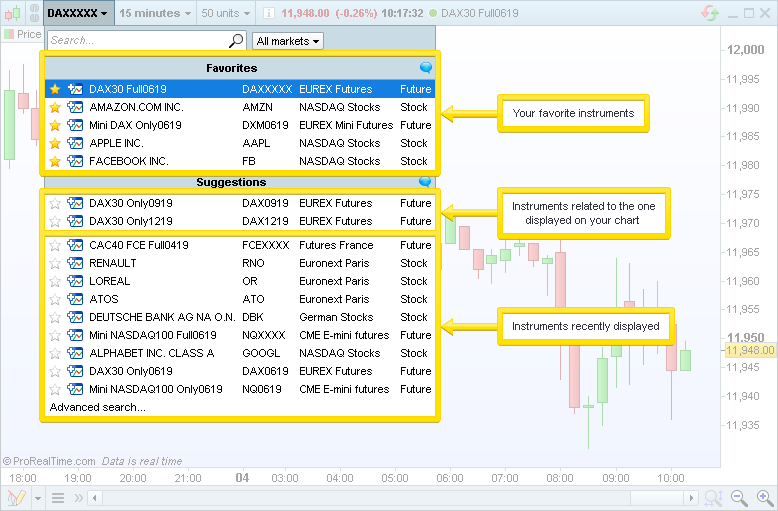 When a trading journal entry is associated with an instrument, you can (as an option) display it as an icon on your chart. 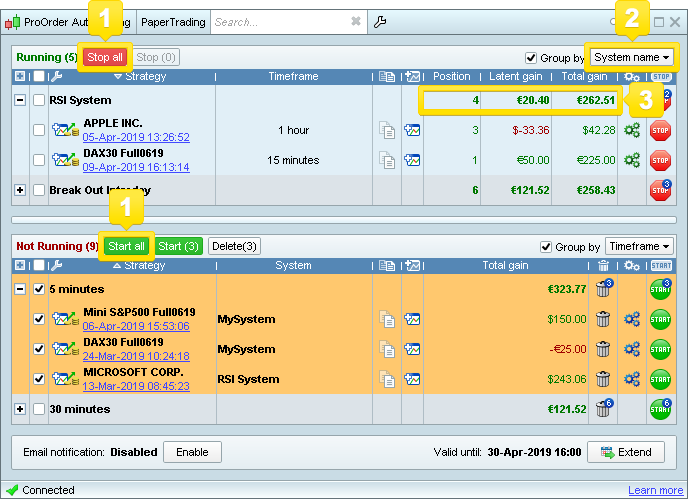 You can also display your trades in the trading journal directly to comment them. 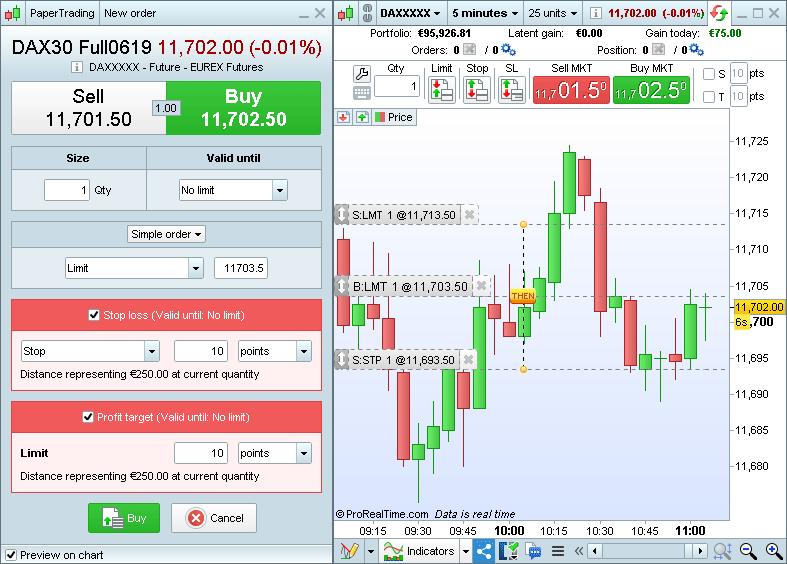 The trading journal can also be displayed as an independent window from the "Display" menu. 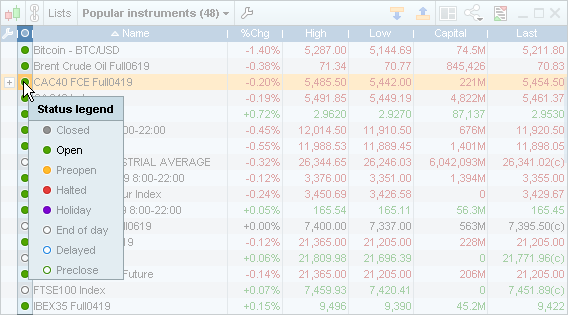 In this view, the trading journal can either display a global trading journal including all comments on all instruments, or display comments only related to a specific instrument. The shortcuts window has been reworked to allow you to view and set several shortcuts at once and allow more flexibility in the type of shortcuts you can set. 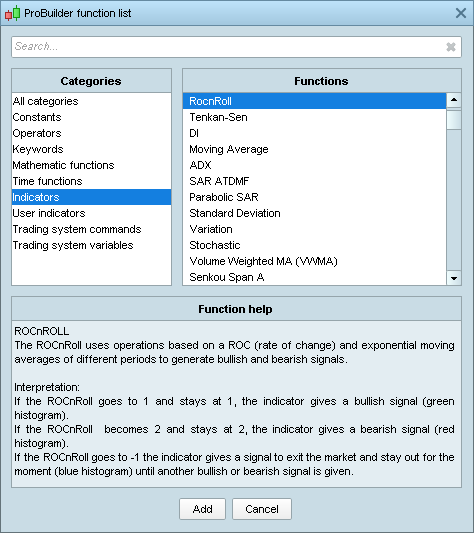 Interface shortcuts let you adjust the zoom and view of your charts, perform a search, open the indicator list and many more things. 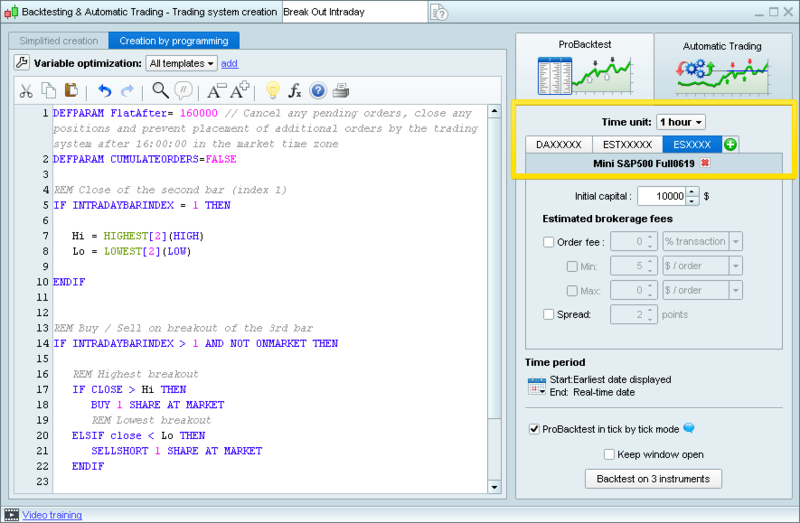 Menu shortcuts will allow you to access any type of window in the platform, including charts, ProScreener, the order book, and tick lists. Object shortcuts allow you to set a shortcut to start drawing any object of your choice or enable different modes such as alerts, or drawing assistance. Template shortcuts let you open each of your own personal templates without going through the templates menu. Instrument shortcuts let you instantly open a chart or order book of any instrument of your choice. From the instrument search results, click on the star icon next to an instrument's name to set it as favorite. Once an instrument is set as favorite, you will be able to access it quickly by clicking the name area in any chart or order book. If applicable, you will also see a list of securities related to the instrument currently displayed, and a list of recently viewed securities. You can use your mouse wheel to zoom in the market heatmap. The size of the boxes can be either fixed, determined by trading volume, or determined by exchanged capital for the current day. The color of the boxes is determined by market variation since the previous trading day. Advanced search has been improved to offer the same possibilities. 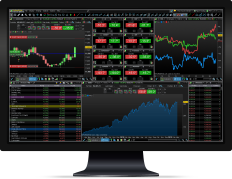 If the number of results is below 50 for the Complete workstation, or below 100 for the Premium workstation, you will be able to export results to a real-time watchlist. A new "Historical Data Mode" in the Premium version allows you to view charts with up to 1 million candles displayed! This mode is dedicated to analysis and backtesting. 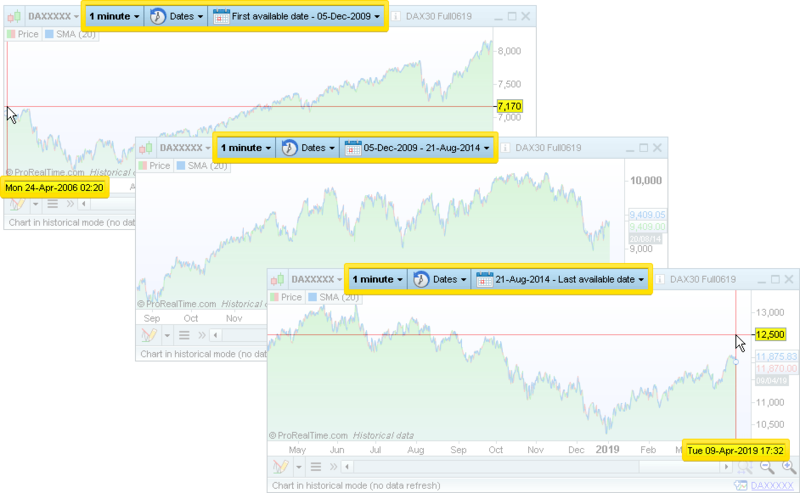 In addition to displaying the last 1 million candles, you can get historical data even farther in the past by selecting a specific date range (ex: Dax Future chart in 1 minute view from 2009 to 2014). Up to 3 charts in historical mode with up to 1 million candles of each can be displayed at one time, either on the same instrument or on different instruments. Notifications appear on the right of the screen. You can choose to either have them remain on screen until you click them or disappear automatically after a few seconds. Notifications are also regrouped in a dedicated notification window. If you missed notifications, a badge in the main window will show a count and allow you to display them. 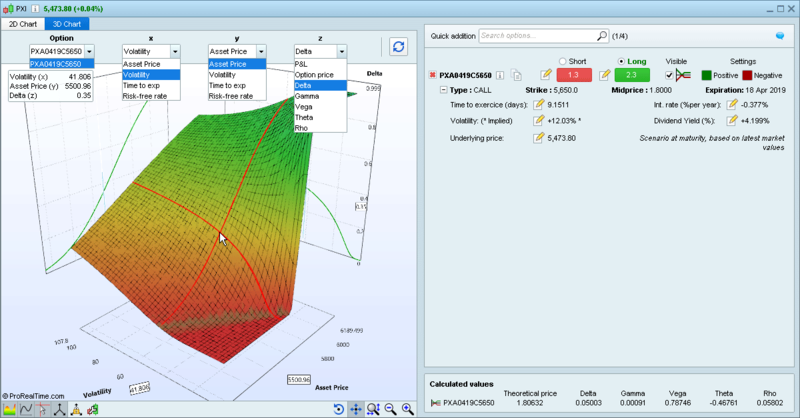 The options pricer chart can now be viewed as a 3-dimensional chart. You can now run a backtest on multiple instruments simultaneously from the backtest creation window (Premium version only). Optimizations can also be run on several instruments at a time (Premium version only) and the results are displayed in one window for easy comparisons. The line “Combined results” shows the combined results for the best combination for each instrument. You can save a combination of variables of your choice by clicking the disk icon in the table. 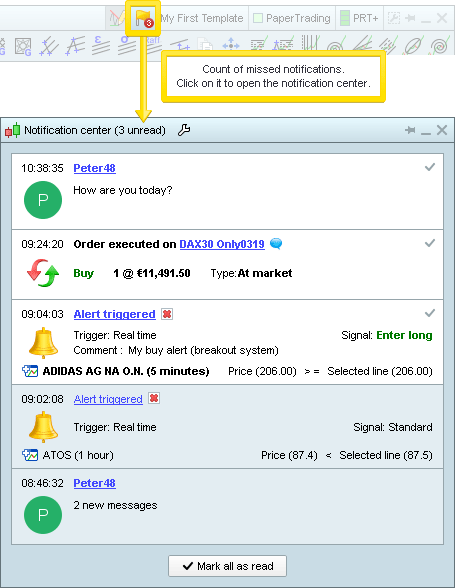 You can prepare a strategy for automatic trading with the values of the line by clicking on the gear icon to send it to ProOrder. Optimization for backtests can now be based on more criteria than before to maximize gains or minimize risk. 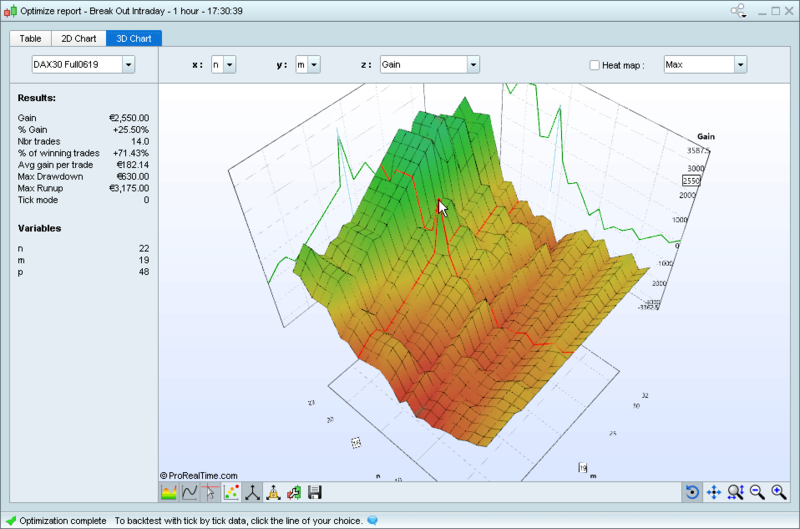 In addition to the table format, optimization results can now be displayed as a 2D chart or 3D chart. 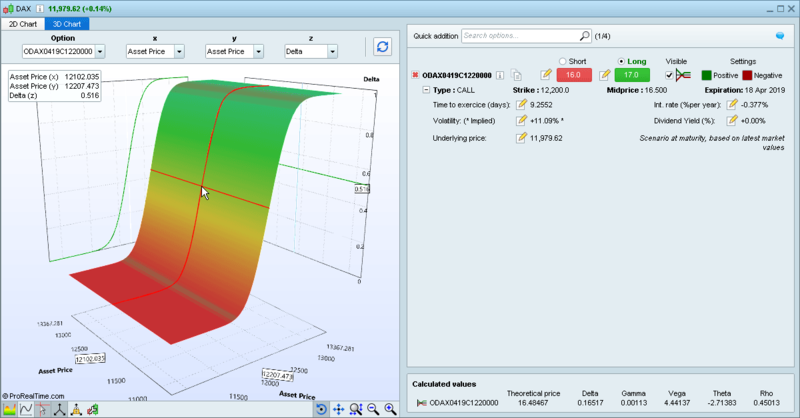 In the 3D chart, the X and Y axis show variables used in the backtest. The Z-axis can show things like gain, drawdown or runup. The ProBuilder engine to calculate personal indicators has been redone to significantly improve performance. Using CALL instructions in your personal indicators can be up to 10 times faster. 1 - Start or stop several strategies at the same time. 2 - Strategies can be grouped by name, instrument or time frame. 3 - Global view of gains and positions for a group of strategies. 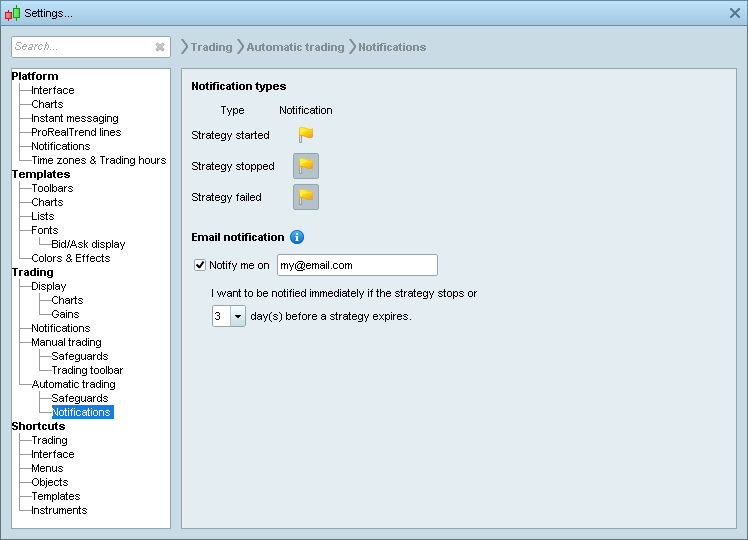 You can choose to receive email notifications when your strategies are stopped or about to expire. You can now create alerts based on price levels in 1 click. The configuration of the alert will depend on the cursor position relative to current value. For example, if you create an alert below the current price, the alert will trigger when price <= the alert price. Pre-Open prices will now be displayed on charts and lists (during market pre-open). When trading on a stock is suspended, the price and time that trading will reopen are now displayed on the chart (when the exchange provides this information). A datafeed status icon shows you the current market status (pre-open / open / closed / vacation) and/or your type of access (real-time / delayed / end-of-day). The new templates menu has been reworked. It now shows a preview of all your saved templates, including the approximate window dispositions and number of screens the template was saved with, making it more easy to manage your templates when you are using your ProRealTime platform on several computers (for example a desktop computer with 2 screens and a laptop). Modal popup windows will now always appear on the screen where your mouse is placed so that they are easy to find. Date selectors have been improved and now display a calendar to pick a date. Hovering over a line in a list highlights this line for easier readability. By default, Market buttons display the "Sell" on the left and the "Buy" on the right. You can now choose to invert their position (Options Menu > Trading Options > Display). Also discover the features already added in previous versions, or send us your ideas and suggestions for the next version.